How do app download QR codes work? Much like any other marketing goals, approaching app downloads in the regular and classic method won’t get you too far. 1. Consumers see your poster. 2. They may or may not remember the brand name. 3. Next, if they are really interested and remember the app name, they search for it on the app marketplace. 4. While they do that they might also find other interesting apps in the same space. 5. After all the distraction if they still find your app unique and promising, they download it. 2. If it’s interesting to them, all they have to do is - scan and download! No distractions or friction involved! CAN QR CODES OPEN APPS? Marketers and small business owners often want to run campaigns that take users directly into an app section. This could be a women’s section on an e-commerce app, an Instagram business page or the hotel tab on a travel app. 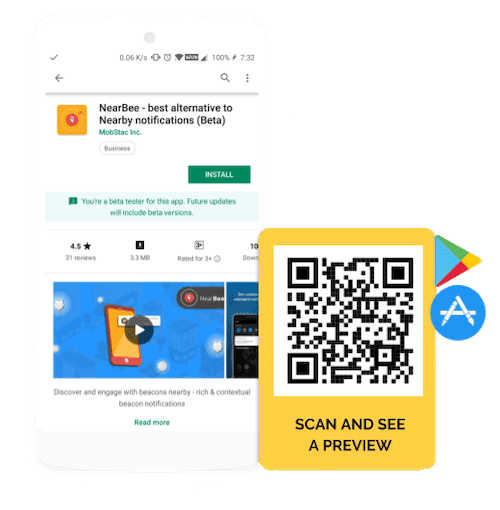 Deep-linking mobile apps with QR codes provides users with an easy and seamless way of accessing a specific feature within the app. What happens when the app is not installed? In this case, depending on which smartphone is being used, the link redirects to the respective app store. Where can you leverage app download QR codes to promote mobile app download? A good business card not just delivers contact details to prospects but also help them connect with your brand in the most interactive, powerful and meaningful way. A lot of business cards mention their mobile apps on them, but it’s difficult to guarantee user attention. On the other hand, an attractive QR code draws attention and instantly allows the user to scan and download an app (if they find it exciting). Shelby Montross uses QR code on their business cards to send their phone number, address, email address and twitter account to users. The same can be done with mobile apps. QR codes in emails and email signatures work even better. This is because of the frequency and the reach. On average, a small business sends 2000 emails in a month. That is way more than the number of business cards they would distribute. Not just that, it also saves the printing cost. Add an app download QR code to the signature and let your readers know why downloading the app would make their lives easier, more interesting or insightful. Posters, product labels, takeaway bags and billboards are great mediums for promoting apps. The poster positioning and advantage of downloading the app are other factors that have important roles to play. QR codes on advertising channels make it easy for passers-by to react instantly to an offer or get an app they are interested in. Alternatively, you could also partner with businesses who already have a QR code on their product. With dynamic QR codes (one QR code, multiple campaigns), these businesses can provide fixed time slots (maybe a few months) to promote a new app. Taco Bell and ESPN did a similar joint QR code campaign to promote Bowl Championship series. More than 225,000 taco bell customers scanned the QR code featured on Taco Bell cups and taco boxes. Use the newspaper and print ads space to clearly define the problem your app solves. Add an app download QR code to make the download process seamless and instant. Add QR codes to app download ad campaigns, targeting user segments browsing through desktop. This helps in calculating the conversion rate from app-interested traffic to app downloads. It also helps you understand which city, country or area is gravitating towards your app. It is a great way to test the target audience without investing in surveys and detailed customer analysis reports. Deliver relevant information right to the user’s smartphone with just a scan of the QR code. Get more like, shares and follows on Facebook with the help of QR codes that lead directly to your Facebook profile/business page. Deliver deals and offers in real-time using Coupon QR codes. Gain customer loyalty by helping them save some money. Increase footfalls by assisting customers in hassle-free navigation to your store location. Let users view your videos with just a scan of a QR code. Get more views to your videos by sharing the videos through QR codes.